Protective immunity to the fungus Candida albicans is mediated by Ag-specific Th1 cells. Paradoxically, some Th2 cytokines are required for the maintenance of Th1-mediated immune resistance to the fungus. Therefore, in addition to the Th1/Th2 balance, other mechanisms seem to be involved in the regulation of Th1 immunity to the fungus. Here we show that CD4+CD25+ T cells, negatively regulating antifungal Th1 reactivity, are generated in mice with candidiasis. CD4+CD25+ T cells were not generated in B7-2- or CD28-deficient mice or in condition of IL-10 signaling deficiency. Accordingly, although capable of efficiently restricting the fungal growth, these mice experienced inflammatory pathology and were incapable of resistance to reinfection. CD4+CD25+ T cells poorly proliferated in vitro; were highly enriched for cells producing IL-4, IL-10, and TGF-β; and required IL-10-producing, Candida hypha-activated dendritic cells for generation. Adoptive transfer of CD4+CD25+ T cells or IL-10-producing dendritic cells restored resistance to reinfection and decreased inflammation in B7-2-deficient mice. These results show that oral tolerance induced by Candida hyphae is required for the occurrence of long-lasting protective immunity after yeast priming. The implication is that preventing reactivation rather than favoring sterilizing immunity to ubiquitous fungal pathogens may represent the ultimate expectation of vaccine-based strategies. Activation of Th cells is a critical event in the organization of effective cellular immune responses to the fungus Candida albicans (1, 2). Experimental evidences indicated that resistance to the fungus correlates with the detection of antifungal Th1 reactivity requiring IL-12 and IFN-γ (1, 2), as highlighted by the increased susceptibility to mucosal candidiasis observed in patients with acquired (3) or genetic (4) defects of cell-mediated immune responses. Early studies implicated the balance of protective Th1 and pathogenic Th2 responses as major regulators of immunity to the fungus (1, 2). Indeed, both Th2 and Th1 cell responses were concomitantly detected in mice with gastrointestinal candidiasis (5). However, the detection of Th2 responses, such as high level production of IL-4, IL-10, and IgE may or may not be observed in conditions of susceptibility to C. albicans infection (1). Paradoxically, some Th2 cytokines, such as IL-4 (6), IL-10 (7, 8), and TGF-β (9), were found to be required for the development and maintenance of protective Th1-mediated antifungal immunity. Therefore, in addition to the Th1/Th2 balance, other mechanisms seem to be involved in controlling and sustaining Th1-dependent immune resistance to the fungus. Ultimately, regulation appears to be an absolute requirement to ensure protective immunity in the absence of immune pathology for a pathogen that also behave as a commensal of the human gastrointestinal and vaginal tracts (10). There is compelling evidence that regulatory T cells specialized in the attenuation of immune responses play a critical role in immune regulation (11, 12, 13, 14, 15, 16). Immune responses driven by Th1 and Th2 cells are also influenced by regulatory T cells the main function of which is counterregulation or suppression of immune responses mediated by Th1 and Th2. Different types of regulatory cells have been defined that are implicated in the control of organ-specific autoimmunity (17, 18, 19), transplantation tolerance (20), and inflammatory responses evoked by enteric organisms (21). Pathogen-specific regulatory T cells, with immunosuppressive activity, have also been described, such as those induced by chronic viral (22) or bacterial (23) infections. Within the expanding family of costimulatory molecules (24), the B7/CD28 costimulatory pathway is a major regulatory pathway for the control of immune responses (25). Although with some overlap, each member of the B7/CD28 family has distinct functions. Engagement of CD28 on the surface of T cells by B7-1 (CD80) or B7-2 (CD86) expressed on APCs provides a potent costimulatory signal (26). CD28/B7 interactions lead to T cell proliferation, differentiation, and cytokine production. In contrast, engagement of CTLA-4 on activated T cells by B7-1 or B7-2 results in an inhibition of T cell responses (27). B7/CD28 costimulation is also required to maintain the survival of the regulatory CD4+CD25+CD62 ligandhigh T cells (28). In murine candidiasis, overexpression of B7-2, more than B7-1, correlated with enhanced Th1-mediated immune resistance to cutaneous infection with the fungus (29), although regulated expression of both costimulatory molecules was required for the development of protective anticandidal Th1 immunity (7, 30). However, whether each costimulatory molecule plays a distinct, nonoverlapping role in immunity to the fungus has yet to be defined. To define the role of costimulatory molecules and cellular pathways involved in regulation of Th1-mediated resistance to C. albicans, in the present study mice deficient in B7-1, B7-2, and CD28 costimulatory molecules were assessed for 1) pattern of resistance or susceptibility to the disseminated or mucosal primary infection and reinfection, 2) parameters of inflammatory and Th immune responses in infections, and 3) the generation of T cells capable of regulating Th1 resistance to the fungus in vivo. A clear distinction was made between wild-type or B7-1-deficient mice capable of both efficiently opposing fungal infectivity and surviving reinfection and CD28- or B7-2-deficient mice that did not survive reinfection. Lower fungal growth, but signs of exaggerated inflammatory reaction, were observed in the latter types of mice. Accordingly, regulatory T cells producing IL-4, IL-10, and TGF-β, induced on priming with IL-10-producing dendritic cells (DC)3 pulsed with Candida hyphae and capable of preventing excessive inflammatory and Th1 reactivity, were differently induced in the course of the infection, being expanded in wild-type or B7-1-deficient mice, but not in CD28- or B7-2-deficient mice. Female BALB/c mice, 8–10 wk old, were purchased from Charles River (Calco, Italy). Homozygous, recombination-activating gene (RAG)-2-, IL-4-, CD28-, B7-1-, and B7-2-deficient mice on BALB/c background were bred under specific pathogen-free conditions in the Animal Facility, Perugia University (Perugia, Italy). Procedures involving animals and their care were conducted in conformity with national and international laws and policies. The origin and characteristics of the C. albicans virulent strain and the live vaccine strain used in this study have already been described in detail (6, 7). For disseminated infection, mice were injected i.v. with either 5 × 105/0.5 ml virulent strain delivered via the tail vein (acute disseminated infection) or 106 low virulence strain followed 14 days later by infection with the virulent strain (secondary disseminated infection). For gastrointestinal infection, 108 virulent Candida cells were injected intragastrically (i.g. ), via an 18-gauge 4-cm-long plastic catheter, in a volume of 0.2 ml saline per mouse, as described elsewhere (5). Quantification of fungal growth in the organs of infected mice (4–6 mice per group) was performed by plating serial dilutions of homogenized organs in Sabouraud dextrose agar, and results (mean ± SE) were expressed as CFU per organ. Mice succumbing to fungal challenge were routinely necropsied for histopathological confirmation of candidiasis. For histology, tissues were excised and immediately fixed in formalin. Sections (3–4 μm) of paraffin-embedded tissues were stained with periodic acid-Schiff reagent and examined for histology as described (5). Total and differential white blood cell counts were done by hemocytometry and by staining blood smears from transplanted mice with May-Grünwald-Giemsa reagents (Sigma-Aldrich, St. Louis, MO) before analysis. Treatments with B7-1- or B7-2-neutralizing mAbs (BD PharMingen, San Diego, CA) were done on days 0, 1, and 2 after the acute disseminated infection or on days 1, 3, and 5 after the gastrointestinal infection. Control mice were injected with an unrelated, isotype-matched Ab. Anti-IL-10R mAb (1B1.3) (31) was given i.p. at a total dose of 500 μg on days 1, 3, and 7 after the gastrointestinal infection. Control mice received an equivalent amount of purified GL.113 mAb. For the candidacidal assay, peripheral blood neutrophils, obtained by Ficoll-Hypaque (Pharmacia, Peapack, NJ) density gradient centrifugation, were plated (1 × 106/100 μl/well) in 96-well flat-bottom microtiter plates and incubated with 1 × 105/100 μl/well C. albicans yeasts for 1 h, as described (6, 7, 8, 9) The percent of CFU inhibition (mean ± SE) was determined as a percentage of colony formation inhibition = 100 − (CFU experimental group/CFU control cultures) × 100. For analysis of costimulatory molecule surface expression, cells were sequentially reacted with 10 μg/ml FITC-conjugated anti-B7-1 (16-10A1) or PE-conjugated anti-B7-2 (GL1) mAbs (BD PharMingen). For lymphocyte analysis, cells were reacted with FITC-conjugated anti-CD4 (RM4-5), or anti-CD8α (53-6.7) mAbs (BD PharMingen). For double staining, splenocytes were sequentially reacted with saturating amounts of FITC-conjugated anti-CD4 mAb and PE-conjugated anti-CD25 (PC61; BD PharMingen). Before staining with the relevant mAb, cells were incubated at room temperature with 5 μg of anti-FcγR mAb (2.4G2; BD PharMingen). Cells were analyzed with a FACScan flow cytofluorometer (BD Biosciences, San Jose, CA). Nonviable cells were excluded from analysis by accepted procedures involving propidium iodide and narrow forward-angle light scatter gating. Control staining of cells with irrelevant Ab was used to obtain background fluorescence values. Data are expressed as a percent of positive cells over total cells analyzed. CD4+ T cells were purified from the mesenteric lymph nodes (MLN) or thymuses of mice by panning procedures, as described (6). CD4+CD25+ cells were separated by magnetic separation of CD4+ cells reacted with biotin-conjugated anti-CD25 (10 μg/108 cells) on ice for 30 min, followed by streptavidin MicroBeads (Miltenyi Biotec, Bergisch Gladbach, Germany). DC were purified from PP (PP-DC) by magnetic cell sorting with MicroBeads (Miltenyi Biotec, Germany) conjugated to hamster anti-mouse CD11c mAbs (clone N-418), as described (32). Consistent with previous reports (32), myeloid, lymphoid, and double-negative DC were present in the PP-DC on FACS analysis (data not shown). RAG-2- or B7-2-deficient mice injected with C. albicans i.g. 1 wk before received 106/0.5 ml of PBS of CD4+CD25+ or CD4+CD25− cells given i.v. or 3 × 105/20 μl of PBS of Candida-pulsed DC given s.c. T cells were from MLN of different strains of mice at 1 wk after the gastrointestinal infection. PP-DC were from uninfected BALB/c mice. One week after the adoptive transfer, mice were assessed for resistance to reinfection, fungal growth in the stomach, and number of IFN-γ-producing CD4+ T cells in the MLN. Purified CD4+CD25+ and CD4+CD25− cells from MLN or thymuses were labeled with CFSE (Molecular Probes, Eugene, OR) (33). Cells were suspended in complete medium (RPMI containing 10% FCS, 50 mM 2-ME, 1 mM sodium pyruvate, 10 mM HEPES, and 50 μg/ml gentamicin) at 106/ml, and the CFSE was added at the final concentration of 1 μM. The cells were incubated on anti-CD3ε-coated plates (clone 145-2C11; BD PharMingen) in the presence of 1 μg/ml soluble anti-CD28 mAb (clone 37.51; BD PharMingen). Coating was accomplished by pre-exposure of individual wells to 10 μg/ml murine anti-CD3ε mAb in bicarbonate buffer (pH 9.6) overnight at 4°C. After 72 h, the labeling was terminated by the addition of cold RPMI, and the cells were analyzed by flow cytometry. For pulsing, 106 PP-DC were exposed to live unopsonized yeasts or hyphae (at DC:fungi ratio of 1:1 and 1:10, respectively) for 2 h before addition of 2.5 μg/ml amphotericin B (Sigma-Aldrich) to prevent Candida overgrowth, as described (34). After pulsing, the cells were left for an additional 22 h in culture before measurement of cytokine in the supernatants and adoptive transfer into recipient mice. Unfractionated cells (106/ml) from MLN were cultured in complete medium in flat-bottom 96-well plates in the presence of inactivated Candida cells, as described (6, 7, 8, 9). After 48 h of culture, the levels of IFN-γ, IL-4 and IL-10 production in culture supernatants were assayed by ELISA. For IL-12 p70 production, cells were stimulated with IFN-γ and LPS for 24 h, as described (6). The levels of IFN-γ, IL-4, IL-10, and IL-12 p70 were determined by commercially available specific ELISAs (from BD PharMingen and R&D Systems, Minneapolis, MN) using paired anti-cytokine mAbs, as described elsewhere (6, 7, 8). Cytokine titers were calculated by reference to standardcurves, constructed with known amounts of recombinant cytokines (BD PharMingen and, for IL-12p70, R&D Systems). Cytokine-producing cells were enumerated by ELISPOT as described (33). Briefly, purified cells from MLN and thymuses were cultured (1 × 102–1 × 105 cells/well) in complete medium for 18 h in 96-well plates using pairs of mAbs as described (35). ELISPOT for TGF-β was done using coating and blocking mAbs from Promega (Promega Italia, Milan, Italy). The enzyme was avidin-alkaline phosphatase conjugate (Vector Laboratories, Burlingame, CA), and the substrate was 5-bromo-4-chloro-3-indolyl phosphate-p-toluidine salt (Life Technologies, Gaithersburg, MD). Results were expressed as the mean number of cytokine-producing cells (±SE) per 104 cells, calculated using replicates of serial 2-fold dilutions of cells. Survival data were analyzed using the Mann-Whitney U test. Student’s t test was used to determine significance of values among experimental groups. Significance was defined as p < 0.05. The data reported are either from one representative experiment of three independent experiments (FACS analysis) or pooled from three to five experiments, otherwise. The in vivo groups consisted of six to eight mice per group. To assess whether parameters of innate or adaptive immunity to the fungus were influenced by costimulatory molecules, we resorted to different experimental models of infection, in which the relative contribution of the innate and the adaptive immunity is clearly defined (36). To evaluate parameters of innate resistance, each type of mouse was injected i.v. with virulent Candida cells and assessed for fungal growth, recruitment, and effector activity of peripheral polymorphonuclear cells. No differences were observed in the handling of the fungus by the innate cells from the different types of mice (Table I⇓). All mice succumbed to the infection, had a comparable fungal growth in the kidney, and did not show differences in the ability to recruit polymorphonuclear cells or to exhibit fungicidal activity. Similarly, no differences were observed on administration of anti-B7-1 or anti-B7-2 mAbs to wild-type mice. Therefore, these results would suggest a limited role, if any, of costimulatory molecules in the innate immune response to the fungus. To assess parameters of adaptive Th immunity, we resorted to the vaccination models of infection in which mice injected either i.v. with low virulence Candida cells (disseminated infection) or i.g. with virulent cells (gastrointestinal infection) are reinfected i.v. with virulent cells (36). Mice were evaluated for survival, ability to restrict the fungal growth, and parameters of inflammatory and Th responses. We found major differences among the different types of mice in terms of resistance to reinfection and inflammatory pathology. In the disseminated infection, wild-type and B7-1-deficient mice survived challenge with virulent Candida cells, whereas CD28- or B7-2-deficient mice did not (Fig. 1⇓A). In some experiments, the latter groups did not survive the primary infection (data not shown). Paradoxically, the ability of CD28- or B7-2-deficient mice to restrict the fungal growth in the kidneys was even higher than that of wild-type or B7-1-deficient mice (Fig. 1⇓B). In addition, in gastrointestinally infected mice, the fungal growth in the stomach was different among the different types of mice and paralleled that observed on reinfection: it was higher in wild-type and B7-1-deficient mice than in CD28- or B7-2-deficient mice (Fig. 1⇓C). Interestingly, treatment of wild-type (Fig. 1⇓D) or CD28-deficient (Fig. 1⇓E) mice with anti-B7-1 or anti-B7-2 mAbs significantly increased or decreased, respectively, the fungal growth in the stomach on the primary gastrointestinal infection. The fungal growth was also decreased in the stomach of B7-1-deficient mice on treatment with anti-B7-2 mAb (Fig. 1⇓F) but not in the stomach of B7-2-deficient mice on treatment with anti-B7-1 mAb (Fig. 1⇓G). Similar to what was observed in the disseminated infection, wild-type and B7-1-deficient mice were capable of resistance to reinfection (data not shown). Altogether, these results would suggest that CD28 or B7-2 deficiency, but not B7-1 deficiency, impairs immune resistance to C. albicans, as revealed by the susceptibility to reinfection and failure to control the mucosal infection. Intriguingly, however, the failure to survive reinfection did not correlate with an excessive fungal growth in the relevant organs, as occurs in conditions of Th2 activation (1). Histopathological examination of the stomachs of infected mice revealed the presence of Candida cells present in the keratinized layer, at the cardial-atrium fold level, with a limited inflammatory reaction in wild-type and B7-1-deficient mice (Fig. 2⇓, A and B). In contrast, fewer Candida cells with signs of exaggerated inflammatory reactions, such as acanthosis, parakeratosis, and abundant inflammatory cells were present in the stomach of CD28- or B7-2-deficient mice (Fig. 2⇓, C and D). Therefore, although capable of efficiently controlling the fungal growth, CD28- or B7-2-deficient mice were not able to fully oppose fungal infectivity and apparently experienced an excessive inflammatory reaction. Course and outcome of disseminated or gastrointestinal C. albicans infection and reinfection in BALB/c, B7-1 (B71)-, CD28-, or B7-2 (B72)-deficient mice. Mice were injected either i.v. (A and B) with 106 low virulence Candida cells and reinfected 2 wk later with 106 virulent Candida cells or i.g. (C–G) with 108 virulent Candida. Fungal growth (CFU) was evaluated in the kidneys (B), 3 days after reinfection or in the stomach (C–G), 1 wk after the i.g. infection. Treatment with anti-B7-1 or anti-B7-2 mAbs was done on days 1, 3, and 5 after the i.g. infection. Control mice were injected with an unrelated, isotype-matched Ab. Shown are the results pooled from five experiments, each consisting of groups of eight mice. ∗, p < 0.05, CD28- or B7-2-deficient vs BALB/c mice and Ab-treated vs untreated mice. 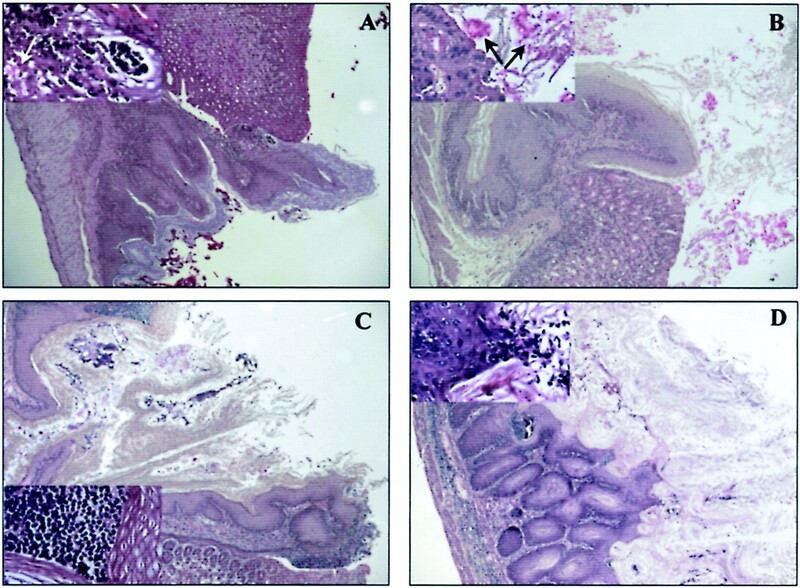 Pathological examination of the stomach of mice with gastrointestinal C. albicans infection. Periodic acid-Schiff-stained medial sections from the stomach of BALB/c (A) and B7-1 (B)-, CD28 (C)-, and B7-2 (D)-deficient mice, 1 wk after the i.g. infection with C. albicans. Note the presence of fungi (arrows) in the stomach of BALB/c and B7-1-deficient mice at the level of the cardial-atrium fold, with limited signs of inflammatory cell recruitment (magnified in the inset), as opposed to signs of exaggerated inflammatory reaction, such as acanthosis, parakeratosis, abundant inflammatory cells (magnified in the inset), and very few Candida cells in the stomach of CD28- or B7-2-deficient mice. Because susceptibility or resistance to mucosal candidiasis is considered to reflect the pattern of locally induced Th reactivity (1, 5, 36), we measured levels of IFN-γ, IL-4, IL-10, and IL-12 in culture supernatants of Ag-activated cells from MLN after gastrointestinal infection. We found that levels of IFN-γ and IL-12 were elevated in each type of mouse on the infection, although the levels of IFN-γ were significantly higher in B7-2-deficient mice than in the other types of mice. The levels of IL-4 and IL-10 were instead significantly higher in B7-1-deficient and significantly lower in CD28- or B7-2-deficient than wild-type mice (Fig. 3⇓A). Similar results were obtained in the spleens of mice after reinfection (data not shown). 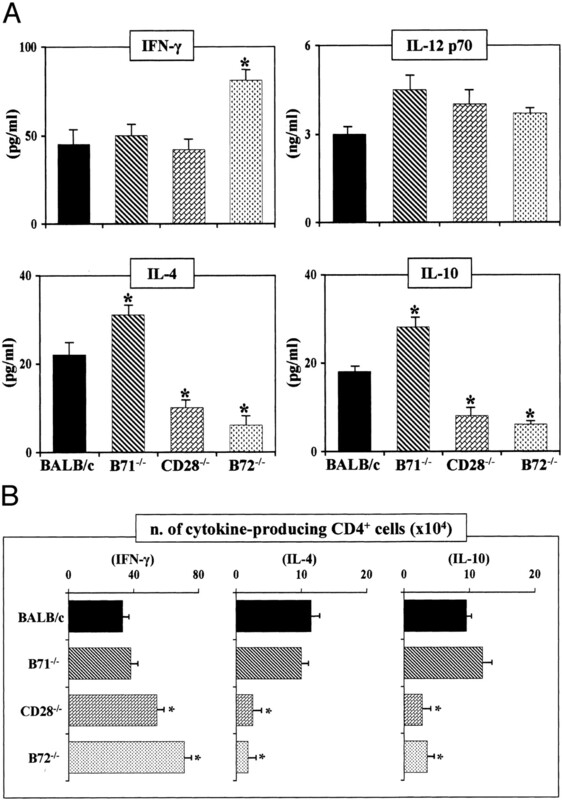 ELISPOT confirms these results by showing that the number of CD4+ T cells producing IFN-γ was significantly lower and that producing IL-4/IL-10 significantly higher in BALB/c and B7-1-deficient mice than in CD28- or B7-2-deficient mice (Fig. 3⇓B). Analysis of cytokine gene expression on purified CD4+ T lymphocytes revealed that messages of IFN-γ, IL-4, and IL-10 were present in wild-type and B7-1-deficient mice, as opposed to the strong expression of the IFN-γ message only in CD28- or B7-2-deficient mice (data not shown). These data are reminiscent of our previous findings on patterns of cytokine production in gastrointestinal candidiasis (5), because they show that both Th1 and Th2 cytokines are present in the MLN of wild-type-infected mice. However, the balance between Th1 and Th2 cytokines is shifted toward the Th1 pattern in CD28- or B7-2-deficient mice and to the Th2 pattern in B7-1-deficient mice. Moreover, the data show that the occurrence of Th1 responses to the fungus is relatively independent from the B7/CD28 costimulatory pathway. Th1 and Th2 cytokine production in mice with gastrointestinal C. albicans infection. BALB/c, B7-1- (B71), CD28-, or B7-2 (B72)-deficient mice were injected i.g. 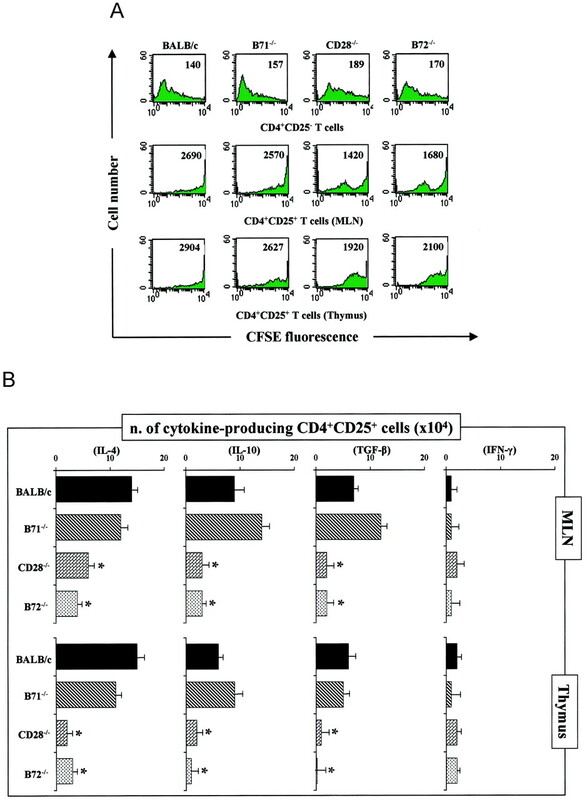 with 108 C. albicans 1 wk before assessing the cytokine levels in culture supernatants of Ag-stimulated unfractionated cells (A) or the number of cytokine-producing CD4+ T cells from MLN (B). For IL-12 p70 production, cells were stimulated with IFN-γ and LPS for 24 h. Cytokines were assessed by ELISA. The number of cytokine-producing cells were enumerated by ELISPOTs on freshly isolated purified CD4+ T cells from MLN as detailed in the Materials and Methods. Results are expressed as the mean number of cytokine-producing cells (±SE) per 104 cells. Shown are the results pooled from three experiments, each consisting of groups of six animals. ∗, p < 0.05, B72-deficient vs BALB/c mice (for IFN-γ) and B71-, CD28-, or B72-deficient vs BALB/c mice (for IL-4 and IL-10 (A) and CD28- or B72-deficient vs BALB/c mice (B). To understand whether the patterns of cytokine production observed in the different strains of mice could be associated with the expansion of distinct cellular phenotypes, we assessed levels of CD4 and CD8 Ag expression in the MLN of mice with candidiasis. Although B7 costimulation regulates CD4/CD8 T cell homeostasis (37), no significant differences were observed in terms of the number of CD4+ and CD8+ cells among the different types of mice, neither uninfected nor infected (the percent of CD4+ and CD8+ cells were 23, 24, 30, and 22 and 14, 13, 14, and 10 in wild-type, CD28-, B7-1-, and B7-2-deficient mice, respectively). Interestingly, levels of CD4+CD25+ cells were instead different among mice (Fig. 4⇓A). These cells were expanded in wild-type and B7-1-, but not in B7-2-, deficient mice 1 wk after the infection. An increase was also observed in CD28-deficient mice, although the number of CD4+CD25+ cells was far below that observed in wild-type or B7-1-deficient mice. At 2 wk after infection, the number of CD4+CD25+ cells declined in wild-type mice but remained high in B7-1-deficient mice. CD4+CD25+ cells from each type of mice also stained positive for the CD45RB and CD69 Ags, although to a variable degree (data not shown). CD4+CD25+ were also expanded in the thymuses, but not in the PP or spleens (data not shown). On assessing levels of local costimulatory Ag expression, we found that B7-2 expression increased in wild-type and B7-1-deficient mice, but not in CD28- or B7-2-deficient mice, 1 wk after infection and decline thereafter (Fig. 4⇓B). B7-1 expression was instead promptly increased in B7-2-deficient mice soon after infection as opposed to wild-type and, of course, B7-1-deficient mice. At 2 wk after the infection, B7-1 expression continued to be elevated in B7-2-deficient mice and to increase in wild-type or, to a lesser extent, in CD28-deficient mice (Fig. 4⇓B). Therefore, it appears that CD4+CD25+ cells are expanded 1 wk after infection, at the time when B7-2 expression predominates over that of B7-1. In contrast, they are not expanded under conditions in which B7-1 expression predominates over that of B7-2, such as in B7-2-deficient mice or, later in infection, in wild-type mice. Moreover, these cells were not expanded in double B7-1- and B7-2-deficient mice (data not shown). The expansion of CD4+CD25+ cells also occurred in mice with the disseminated infection. However, the expansion was not observed in the spleens (data nor shown) but in the thymuses (Fig. 4⇓C). Here again, CD4+CD25+ cells were expanded in wild-type and B7-1-deficient mice, but not in CD28- or B7-2-deficient mice. Expression of CD4, CD25, B7-1 (B71), and B7-2 (B72) molecules in mice with gastrointestinal or disseminated C. albicans infection. At 1 or 2 wk after the i.g. 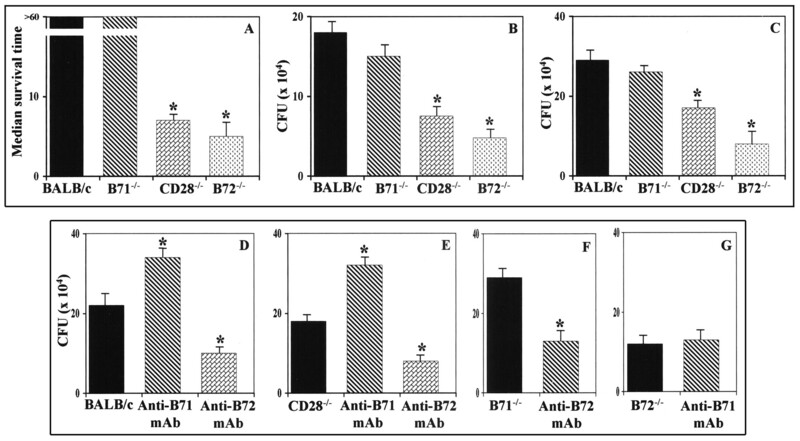 infection (A and B), cells from MLN were sequentially reacted with FITC-conjugated anti-CD4 and PE-anti-CD25 mAbs (A) or FITC-conjugated anti-B7-1 and PE-anti-B7-2 mAbs (B). C, Mice were i.v. injected with low virulence Candida and reinfected with virulent Candida 3 days before FACS analysis of cells from thymuses. Before staining with the relevant mAb, cells were always incubated at room temperature with 5 μg of anti-FcγR mAb. Cells were analyzed with a FACSCan flow cytofluorometer. Values represent the percent of positive cells. Profiles shown are results representative of three independent experiments. To functionally characterize the CD4+CD25+ population expanded in mice with gastrointestinal or disseminated candidiasis, CD4+CD25+ cells were purified from MLN or thymuses of the different mice and assessed for the ability to proliferate in response to anti-CD3ε plus anti-CD28 mAbs and for number of cells producing IFN-γ, IL-4, IL-10, and TGF-β. It was found that proliferation of CD4+CD25+ cells was minimal, as compared with that of CD4+CD25− cells, for BALB/c and B7-1-deficient mice. Proliferation, albeit small, was instead observed with CD4+CD25+ cells from CD28- or B7-2-deficient mice (Fig. 5⇓A). This finding would suggest the existence of functionally different types of cells within the CD4+CD25+ population from the different mice. Moreover, in terms of frequency of cells producing cytokines within the CD4+CD25+ population, we found that the number of cells producing IFN-γ was low in each type of mice and that of cells producing IL-4, IL-10, or TGF-β was high. Interestingly, differences could be observed among the different types of mice, being the number of cells producing IL-4, IL-10, and TGF-β higher in wild-type and B7-1-deficient mice than in CD28- or B7-2-deficient mice, in both the MLN and thymuses (Fig. 5⇓B). The number of IFN-γ-producing cells was elevated within the CD4+CD25− population (data not shown). Proliferative activity of CD4+CD25+ T cells and number of cytokine-producing CD4+CD25+ T cells in mice with C. albicans infection. A, Purified CD4+CD25+ and CD4+CD25− T cells were from MLN 1 wk after the i.g. infection or from the thymuses of mice with disseminated infection at 3 days after reinfection (see Fig. 1⇑). Cells were labeled with CFSE and incubated on anti-CD3ε-coated plates in the presence of soluble anti-CD28 mAb, for 72 h. The labeling was terminated by the addition of cold RPMI, and the cells were analyzed by flow cytometry. Values represent the median fluorescence intensity. B, The number of cytokine-producing cells were counted by ELISPOTs on freshly isolated purified CD4+CD25+ T cells from MLN and thymuses as detailed in Materials and Methods. Shown are the results pooled from five experiments expressed as the mean number of cytokine-producing cells (±SE) per 104 cells. ∗, p < 0.05, CD28- or B7-2 (B72)-deficient mice vs BALB/c mice. B71, B7-1. Requirement of IL-10-producing DC in the generation of regulatory T cells in mice with gastrointestinal candidiasis. A, Number of CD4+CD25+ T cells in the MLN of BALB/c, IL-4-deficient, and BALB/c mice treated with the anti-IL-10R mAb, 1 wk after the i.g. infection. The anti-IL-10R mAb was given i.p. at a total dose of 500 μg on days 1, 3, and 7 after gastrointestinal infection. Control mice received an equivalent amount of purified GL.113 mAb. Cells were sequentially reacted with FITC-conjugated anti-CD4 and PE-anti-CD25 mAbs and analyzed with a FACScan flow cytofluorometer. The numbers represent the percentage of positive cells. Shown are the results pooled from three experiments of eight animals per group. B, PP-DC from wild-type mice were pulsed with live unopsonized Candida yeasts or hyphae (DC:yeast ratios of 1:1 and 1:10, respectively) for 2 h before addition of amphotericin B to prevent Candida overgrowth. Cytokine was measured in culture supernatants 22 h later. ∗, p < 0.05, hypha-pulsed vs yeast-pulsed DC. Shown are the results pooled from three independent experiments, in which duplicate samples were assayed three times. C, PP-DC, pulsed as above, were injected s.c. (3 × 105 cells) into B7-2-deficient mice infected i.g. with C. albicans, 1 wk before. One week after the adoptive transfer, the number of CD4+CD25+ T cells was determined by FACS analysis. Values represent the percentage of positive cells. None, mice not receiving DC. Shown are the results pooled from three independent experiments of eight animals per group. To evaluate the effect of the adoptive transfer of CD4+CD25+ cells in mice with candidiasis, B7-2-deficient mice were infected i.g. and 1 wk later received purified CD4+CD25+ cells from MLN of wild-type, B7-1-, CD28-, or IL-4-deficient infected mice. We also assessed the effect of the adoptive transfer of CD4+CD25+ cells from thymuses or CD4+CD25− cells. The adoptive transfer of CD4+CD25− T cells from each type of mice did not induce resistance to reinfection, although the local fungal burden in the stomach was significantly decreased, a finding confirming the activation of anticandidal Th1 cells in these mice. In contrast, the adoptive transfer of CD4+CD25+ cells from MLN or thymuses of wild-type or B7-1-deficient mice increased resistance to reinfection, as measured by the increased survival (Table II⇓). The primary fungal burden in the stomach was also increased (Table II⇓), but no signs of excessive inflammatory pathology were present (data not shown). These effects were not observed with cells from CD28- or IL-4-deficient mice, although the former slightly increased the fungal burden in the stomach. CD4+CD25+ cells did not modify the fungal growth in RAG-2-deficient as in wild-type mice, a finding implicating that recipient T cells are required for the regulatory activity of the transferred cells. Accordingly, protection always correlated with a decreased number of IFN-γ-producing cells in the MLN (Table II⇓). All together, CD4+CD25+ cells, induced by Candida hypha-activated DC, are expanded in mice with candidiasis and appear to function by limiting antifungal Th1 reactivity and the associated opposing effects. This study is the first demonstration that regulatory T cells are induced during C. albicans infection. The results indicate that although the activation of CD4+ Th1 lymphocytes can occur in the relative absence of the B7/CD28 costimulatory pathway, the induction of CD4+CD25+ T cells producing IL-4, IL-10, and TGF-β and capable of limiting Th1 cell reactivity is strictly dependent on levels of costimulatory Ag expression, presumably on IL-10-producing DC. Thus, rather than having opposite functions, B7-1 and B7-2 appear to determine the magnitude and the quality of the immune Th1 reactivity to the fungus, i.e., the induction of an efficient antifungal Th1 response without its opposing effects. The importance of the role of CD28-mediated costimulation has been demonstrated in a variety of model systems. The absence of CD28 function results in a greatly reduced ability to respond to protein Ags, parasites (38, 39), and microbes (40, 41). However, many pathogens are able to trigger immune responses that are largely independent of CD28 costimulation (42, 43, 44). The alternative costimulatory molecule, inducible costimulatory protein, that can be induced in the absence of CD28, was found to regulate both CD28-dependent and CD28-independent CD4+ Th responses in vivo (45, 46). Here we show that CD28 is not required for either the early control of the infection by the innate immune system or the CD4+ Th1 cell activation. Early resistance to the infection as well as the production of IL-12 and IFN-γ were not different from those of wild-type mice. Because similar findings were observed in B7-2- or B7-1-deficient mice, this suggests that the activation of anticandidal Th1 cells is relatively independent on the B7/CD28 costimulatory pathway. The pattern of susceptibility and resistance to the infection seen in the different types of mice did not reveal an overt immunodeviation, given that both Th1 and Th2 cytokines were present in each type of mouse and no evidence of extensive fungal growth typically associated with Th2 cell activation (1, 2) was observed in susceptible mice. However, the Th1:Th2 cytokine ratio was different among mice and, paradoxically, Th1 cytokines predominate over Th2 cytokines in mice capable of efficiently restricting the fungal growth, yet succumbing to reinfection, such as the CD28- or B7-2-deficient mice. In contrast, Th2 cytokines predominate over Th1 cytokines in B7-1-deficient mice, which were nevertheless capable of controlling the infection and fully resisting reinfection. Therefore, at variance with pathogenic antifungal Th2 cells, the cells expanded in B7-1-deficient mice appear to be an essential component of the protective host immunity to the fungus. A recent study showed that regulatory T cells may overexpress a subset of Th2 gene transcripts (47). Therefore, although the implication of the CD28/B7 interactions in the generation and maintenance of T cell memory is still controversial (41, 48, 49, 50), our findings point to the existence of cellular pathways dependent on the B7/CD28 interactions and involving IL-4, IL-10, and TGF-β, regulating the anticandidal Th1 immune reactivity. This would be consistent with a series of previous studies suggesting that IL-4 (6), IL-10 (7), and TGF-β (9) are all required for maintaining a long-lasting Th1 immunity to the fungus, yet inhibiting its activation in the inductive phase. The data of the present study show that CD4+CD25+ cells producing IL-4, IL-10, and TGF-β are differently expanded in mice with candidiasis and may account for the different ability of mice to maintain a sustained protective immune response. These cells were not expanded in conditions of B7-2, CD28, or IL-10 deficiencies, concomitantly with heightened antifungal Th1 reactivity and the ensuing opposing effects. In contrast, they were expanded in wild-type and B7-1-deficient mice and were associated with a relatively impaired ability to restrict the local fungal growth but with resistance to reinfection. In wild-type mice, the kinetics of appearance of CD4+CD25+ T cells parallels that of B7-2, given that these cells expanded at the time when B7-2 was maximally up-regulated. Later in infection, both B7-2 expression and expansion of CD4+CD25+ T cells were reduced. Thus, the kinetics of appearance of regulatory T cells parallels that of B7-2. Concomitantly, B7-1 expression was low or high in conditions of maximal expansion or restriction of CD4+CD25+ cells. Therefore, it appears that levels of costimulatory molecule expression at the local sites may determine the extent to which CD4+CD25+ cells will be locally expanded. In accordance with other studies (28), the costimulatory pathway of B7-2/CD28 is associated with the expansion of regulatory T cells. It is known that a subset of regulatory T cells are CTLA-4+ and CTLA-4 might be involved in the activity of these cells (28, 51, 52), because blocking CTLA-4 reversed the activity of CD4+CD25+ T cells in vivo (53). However, CTLA-4 ligation also triggers apoptosis of T cells (54). We found that CTLA-4 expression was slightly increased in concomitance with the expansion of CD4+CD25+ T cells in both the MLN and thymuses of infected mice (data not shown). Structural data indicate that a key function of B7-1 is to generate particularly stable complexes with CTLA-4 (55), a finding that along with the timing of B7-1 and CTLA-4 expression further points to the concept that inhibitory signals delivered by the B7-1/CTLA-4 interaction may terminate T cell activation (56, 57). Whether B7-1 molecules negatively regulate the expansion of CD4+CD25+ regulatory T cells, as our study would suggest, is presently unknown. Different subsets of regulatory cells have been described (11, 12, 13, 14, 15, 16). The subsets may differ in the mode of generation and mechanism of action, although evidence for similarities between the different regulatory T cells has also been shown (11, 12, 13, 14, 15, 16). Certain types of regulatory T cells are preferentially induced at mucosal surfaces (58, 59, 60), where they may limit the excessive inflammatory response to microorganisms and mediate oral tolerance. Others develops in the thymus and are associated with protection from a number of autoimmune processes (61). One form of T cell regulation is mediated by secretion of IL-10 (type 1 T regulatory cells) and/or TGF-β (Th3) after Ag-specific triggering (16, 62). In several experimental systems, CD4+CD25+ T cells are regulatory T cells present in the thymus but also induced at mucosal surfaces (60, 61). Their mechanism of action is dependent on cell-to-cell contact, although the involvement of the suppressive IL-10 and TGF-β has also been described (60). We found that CD4+CD25+ cells producing IL-10, IL-4, and TGF-β were expanded in the MLN and thymuses of mice after gastrointestinal infection or in the thymuses of mice with disseminated infection. Both types of CD4+CD25+ cells appear to have a similar function, given that they poorly proliferate in vitro; contain cells producing IL-4, IL-10, and TGF-β; and inhibited Th1 cells in vivo. This finding suggests that the generation of regulatory cells occurs both in the thymus and in the periphery, although the reciprocal relationship between the two cell populations is not presently known. CD4+CD25+ cells were not generated in conditions of IL-10 deficiency, a finding that may be explained with the notion that IL-10-producing DC have been implicated in the induction of regulatory T cells (58, 63). We found that PP-DC produced IL-10 in response to Candida hyphae but not yeasts. Accordingly, the former, and not the latter, were able to induce the activation of CD4+CD25+ T cells on adoptive transfer into mice otherwise incapable of activating regulatory T cells. CD4+CD25+ T cells were detected in IL-4-deficient mice, albeit at low level. However, they were not as effective as CD4+CD25+ T cells from wild-type mice in increasing Th1 resistance on adoptive transfer, a finding suggesting that IL-4 may be required for the effector activity of regulatory T cells. In this regard, we have already shown that IL-4 produced late in infection served to promote a sustained IL-12 production (6). However, a dysregulated expression of costimulatory molecules in the absence of IL-4 cannot be excluded. Nevertheless, it appears that local levels of B7-2 expression along with the ability of DC to produce IL-10 in response to the fungus are both required for the generation of regulatory T cells during C. albicans infection. The finding that DC produce either IL-4 (34) or IL-10 (this study) on exposure to Candida hyphae agrees with the recent observations that the type of receptors engaged on DC by the fungus will ultimately dictate the pattern of both cytokine production and Th reactivity (64). The pattern of receptors involved in the recognition of yeasts and hyphae of the fungus by subsets of DC at different body sites is presently under investigation. Much remains to be learned about the generation, Ag specificity, and mechanisms of action of regulatory T cells in mice with candidiasis. In terms of generation, preliminary observations suggest that regulatory T cells are induced in mice of different haplotypes (our unpublished observations). Ag persistence seems to be required, as already suggested by others (62), or could be a consequence of otherwise activated regulatory T cells. Self-Ag-reactive regulatory cells capable of inhibiting development of colitis triggered by enteric organisms have been described (21). In this regard, it is worth mentioning that immunological cross-reactivity between C. albicans and human tissues (65) as well as the association of chronic mucocutaneous candidiasis with autoimmune polyendocrinopathy-candidiasis-ectodermal dystrophy (66) have been described. Interestingly, in autoimmune polyendocrinopathy-candidiasis-ectodermal dystrophy, the mutated gene has been shown to be involved in the ontogeny of regulatory CD25+ T cells (67). Although these hypotheses are not mutually exclusive, the findings that a sustained colonization with Candida was required for the induction of a long-lasting protective immunity to the fungus (68) and that hypha-pulsed DC activate regulatory T cells in vivo suggest that epitopes from Candida exist which are endowed with the ability to activate regulatory T cells. In this regard, it has long been known that the ability of C. albicans to establish an infection involves multiple components of this fungal pathogen, but its ability to persist in host tissue may involve primarily the immunosuppressive property of a major cell wall glycoprotein, mannan (69). Mannan and oligosaccharide fragments of mannan are potent inhibitors of cell-mediated immunity and appear to reproduce the immune deficit of patients with the mucocutaneous form of candidiasis (70). Pathogen-specific regulatory T cells have been demonstrated in viral (22) and bacterial (23) infections. Here we show that regulatory T cells, the specificity of which is yet to be defined, are also induced in a fungal infection. It is likely that immunoregulation is one key component of the complex dynamic of the host-fungus interaction that may operate from commensalism and/or exposure to fungi to severe infections. In the case of C. albicans, it appears that oral tolerance induced by hyphae appears to be as protective as yeast priming in the occurrence of antifungal protective immunity; this would be consistent with a number of clinical observations indicating that, although a commensal, either the recovery of the fungus from the gastrointestinal tract as well as the detection of the underlying Th1 reactivity, such as delayed-type hypersensitivity and lymphoproliferation, may fluctuate in healthy subjects and in infection (10, 71). In chronic mucocutaneous candidiasis, both anergy and active lymphoproliferation and variable delayed-type hypersensitivity reactivity to the fungus are indeed observed (71, 72). It is conceivable that these cells, by dampening Th1-mediated antifungal resistance, will oppose inflammatory pathology at the expenses of fungal persistence. It is indeed clear that regulation of antifungal immunity occurs at the levels of T cells, given that the ability of CD4+CD25+ T cells to affect antifungal resistance was impaired in T cell-deficient mice. A corollary to these findings would be that conditions or vaccination strategies favoring a sterilizing immunity to the fungus may limit the activation of regulatory cells and thus negatively affect the generation of memory immunity. The importance of Ag persistence in the generation of memory immunity to pathogens has recently been reported (73, 74). We thank Robert L. Coffman (Dynavax Technologies, Berkeley, CA), for the supply of the anti-IL-10R mAb, and Manfred Kopf (Swiss Federal Institute of Technology, Zurich, Switzerland), for the supply of breeding pairs of RAG-2-, IL-4- and CD28-deficient mice. We thank Lara Bellocchio for dedicated editorial assistance and Dr. Laura Spinelli (BD BioSciences, Milan, Italy), for assisting us with the FACS analysis. We are also grateful to Carla Barabani of the Animal Facility of the University of Perugia School of Medicine. ↵1 This study was supported by National Research Project on AIDS Contract 50D.27, “Opportunistic Infections and Tuberculosis,” Italy. ↵3 Abbreviations used in this paper: DC, dendritic cells; MLN, mesenteric lymph node; PP, Peyer’s patches; PP-DC, DC purified from PP; i.g., intragastrically; RAG, recombination-activating gene. Mathews, H. G. L., L. Witek-Janusek. 2002. Host defense against oral, esophageal, and gastrointestinal candidiasis. R. A. Calderone, ed. Candida and Candidiasis 179 ASM Press, Washington, DC. Bacci, A., C. Montagnoli, S. Bozza, and L. Romani. 2001. Skewing of Th differentiation during the DC-microbe interaction. In Keystone Symposia 7, Keystone Symposia, Silverthorne (Abstr. ).